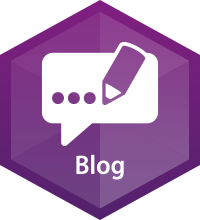 Trends in Drug Supply Chain Security – API Track & Trace on the Horizon? Drug product volumes have been shrinking as increasingly niche products emerge to treat various conditions. Coupled with the rise of pharmaceutical manufacturing outsourcing, this has led to a reconsideration of dedicated single-drug facilities. Many regulatory bodies worldwide have responded to this new dynamic by tightly regulating multidrug facilities. This is especially true of facilities in which cytotoxic cancer compounds are being produced – in some cases alongside non-cytotoxic compounds. Cytotoxic drugs – commonly referred to as chemotherapeutic agents – kill selected cells, typically malignancies and tumors. While they are sometimes used to treat other conditions, they are most frequently found in oncology therapeutics – and continue to be a rapidly-expanding pharma industry niche. There are non-cytotoxic cancer drugs available as well. Such non-cytotoxic drugs function quite differently than their cytotoxic counterparts, and pose fewer traditional manufacturing contamination hazards. Among the non-cytotoxic cancer drug options is targeted therapy (also referred to as molecularly-targeted therapy). Unlike traditional chemotherapy drugs which interfere with rapidly-dividing cells, targeted therapies (which can include both biological and chemical modalities – e.g., antibody-drug conjugates), typically disrupt the molecules indicated in tumor growth. These drugs are not considered cytotoxic drugs as they do not destroy cells. In many regulatory environments they are permitted to be manufactured in a multipurpose plant – but not in India, where all drugs used for the treatment of cancer are considered cytotoxic drugs. Today, the manufacture of cytotoxic compounds is subject to a high regulatory bar, with tightly-controlled facilities possessing a robust focus on safety. Because of the cell-killing nature of the compounds, avoidance of contamination is emphasized – both of other products (in the case of a multiuse facility) or of the manufacturing infrastructure itself. India remains an outlier in this regard, employing a more stringent dedicated-facility standard than other global regulatory bodies – including the U.S. FDA. While India’s GMPs incorporate those defined by WHO, they also go further in some instances – including the separate dedicated facility requirement even for non-cytotoxic cancer drugs. This came about due to the lack of any mention of such non-cytotoxic cancer compounds in Schedule M. Thus, by interpretation of Schedule M, they are relegated to the same manufacturing considerations as chemotherapeutic agents in spite of their very different mode of operation. This restriction is beyond the scope of U.S. FDA requirements as well, which are compared in this Slideshare. Schedule M also differs from the globally-accepted ICH Q7 Good Manufacturing Practice Guide for Active Pharmaceutical Ingredients. The Q7 Guideline – developed in consultation with global regulatory agencies – has been adopted by the U.S. FDA, the European Union, Japan and most other regulatory authorities. 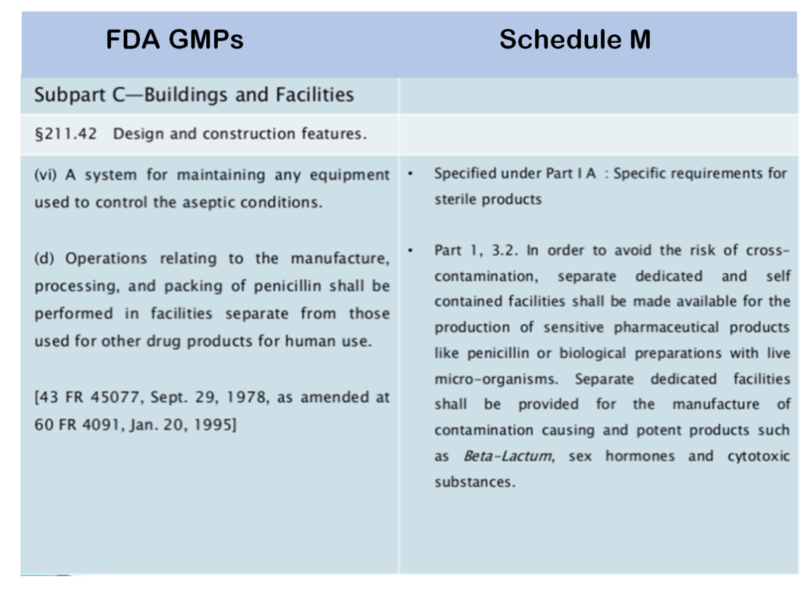 A comparison of the facility requirements in India’s Schedule M and ICH Q7 (see chart below) shows the global regulatory approach towards dedicated facilities. 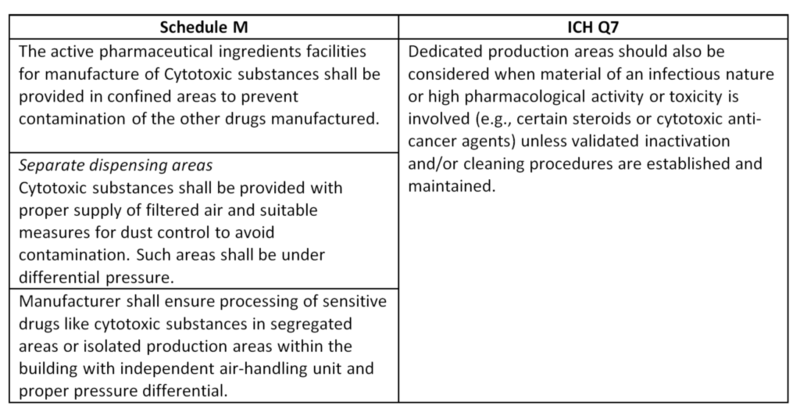 There is a recognition that process & quality control have evolved and tightened sufficiently over the last few decades, with the addition of “unless validated inactivation and/or cleaning procedures are established and maintained.” Absent from ICH Q7 – and other global regulatory structures – is any mention or regulation of non-cytotoxic cancer agent manufacturing. There is no doubt that the extension of GMPs beyond the global standard is the mark of a strong national emphasis on quality and safety. Nonetheless, the interpretation of Schedule M bears revisiting in order to modernize India’s GMPs to account for shifting drug industry conditions. Multipurpose facilities are a way of life in the pharma industry, and even big pharma has begun the shift towards more flexible spaces as smaller, more-targeted drug volumes become increasingly common. Equally as important, however, has been the implementation of better industry-wide practices, including improved contamination risk assessment, mitigation & management techniques – all of which rationalize a new regulatory approach. The comparisons of practices for manufacturing non-cytotoxic oncology APIs in different regulated markets across geographies make clear that India’s regulatory stance on this is unnecessarily burdening the Indian pharma industry. With quantum improvements in analytical instrumentation, a risk-based approach to drug manufacturing and a move towards global regulatory standardization, the need for dedicated production lines in earmarked facilities has undoubtedly diminished. Nonetheless, an incorrect interpretation of Schedule M continues to govern, impeding the global competitiveness of India’s vast pharma industry – a situation which can hopefully change in the near-term.